I've seriously neglected this blog for no reason other than I haven't made the time to sit down and compose something. Which is kind of sad because 2012 was an amazing year on so many levels. The bike volume is very low, which I would attribute to more mountain biking and less road riding. Oh, and to general apathy as well. I suffered mightily for this in October at the Rev3 Half Full Triathlon in Columbia, Maryland. Was it worth it? Absolutely. Did I learn anything? You bet I did. In December I completed my very first cyclocross race at the Miller Chill CX in Bloomington, IL. It was a rainy, muddy day and I was hooked immediately. I am firming up my list of events for 2013. 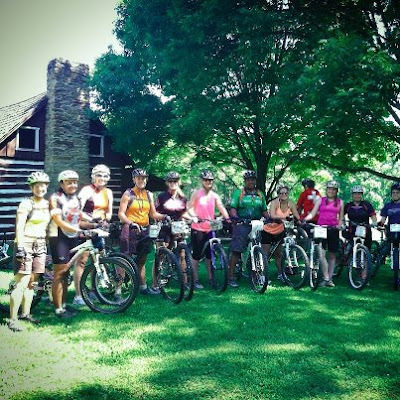 Carved in stone are the Women's Midwest Mountain Bike Clinic and Rev3 Colonial Williamsburg HIM. Other than those two events, the calendar is pretty open. The Fourth of July fell on a Wednesday this year. It was a little odd having a holiday right in the middle of the work week, but you don't hear me complaining. A tradition in the Springfield Bike Club is a ride to Franklin, Illinois for that community's annual Burgoo Festival. Since the forecast called for 100 degrees, we decided to go out early and hopefully beat the worst of the heat. At 6:30 a.m. it was 80 degrees, if that gives you any idea what a lovely day lay before us. What is burgoo, you may ask? Wikipedia defines burgoo as "a spicy stew" usually served with corn bread. There are many regional variations, but the common theme is that there are at least three ingredients --- a vegetable and then various types of meat. The dish served at the Franklin festival is a tame beef/chicken stew (here is the recipe and some info), but I have heard about the use of opossum, raccoon, deer, etc. I do know that the burgoo is cooked in large kettles and stirred for hours by volunteers. Naturally there were a lot of jokes about picking up roadkill along the way and contributing to the cookoff, none of which I found particularly funny. It was about 25 miles to Franklin. I had prepared for the scorching temperatures by putting a polar bottle of water and another bottle of Ironman Perform in the freezer for about 45 minutes, which kept things nice and cool. Sadly, because we had set out so early, the actual festival wasn't even open when we arrived in Franklin. My road bike was making some unhappy gear chattering, so The Other SteveS (not to be confused with my SteveS) performed some experimentation on the little barrel ajduster. We rode up and down the street for a while and got the bike shifting better, if not optimal. At least I had more than three gears. 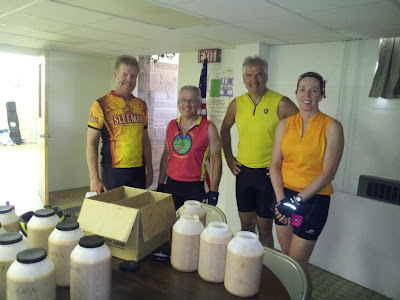 We looked around for a place to refill water bottles and a nice lady directed us to the basement of the nearby Methodist Church, which seemed to be the vortex to the Burgoo Fest. A friendly crew of volunteer ladies and one man not only let us refill our bottles with ice, but sold us some pie. We were the first customers of the day. Riding back, we started passing the bike club riders who had started later. They were in for a hot ride, I was sure glad we got out early. Getting ready to head out of Franklin. I tried gooseberry pie. They tried to warn me that it was tart. I didn't necessarily find it to be sour and enjoyed it. Would definitely order it again. Reminded me of rhubarb pie. The burgoo, cooling in jugs. It smelled like beef stew. hot stew doesn't sound too appealing. basement of the Methodist Church dishing up ice and pie for us. Check in was from 8 to 9 on Sunday morning. Since arriving early at a triathlon is conducive to getting a better spot in transition, we decided to arrive at 7:30 and beat the crowd. This didn’t really prove particularly useful. We did get a good parking spot but we arrived so early. After signing in, clinic participants were given a race bib and directed to a crafts table where an assortment of colorful markers and stickers awaited us. We then created our own unique bib that was to be attached to the front handlebars of our bike with colorful sparkly pipe cleaner dealies. . Actually this was a very cool idea, as it helped the coaches with names. We had to put name, level and city/state. I drew a cartoon on Brenda’s bib of a bike rider crashing into a tree. Some of the stickers were a little too GIRL POWAHish but I selected a nice “Wow”. It seemed safe and if nothing else, if for some reason my bike would be upside down, which meant I was probably injured, they would know I was a mom and maybe try harder to locate my family. I will say one thing about this clinic, if you went away hungry it was your own fault. There was a pretty decent continental breakfast that included muffins, coffee, juice and yogurt parfaits. We had already eaten breakfast but I grabbed a blueberry muffin and stashed it in the car for later. The coffee was waaaaayyyy better than the vending machine coffee at the lodge. Another very cool feature of this clinic is that you don't actually have to own a mountain bike to participate --- you can get a loaner absolutely free of charge! Laura took advantage of this perk and landed this sweet Giant. We learned that there would be 11 in our group, as another coach was combining his group with ours. After roll call we rode through the campground to a grassy slope where the clinic would be conducted. The first order was a bike safety check. It was a little embarrassing to learn that my brake cables needed adjusting and the headset needed tightening up. Coach Todd advised everyone to have their brakes moved inward a bit so that your index finger was just at the end of the brakes, thus affording more control. On my bike this translated to about an inch. We ride in circles oh yes we do! Then we dropped into the “Attack” pose, same thing just lower and further back. We rode in circles around the coaches, alternating Ready and Attack and being reminded to keep elbows and knees wide.I got really nervous every time I had to run this gauntlet. It felt a little like being on parade. Scarecrow” or “Windshield Wiper” drill – Keeping arms nice and wide, practice guiding the bike by straightening one arm. It’s hard to explain but basically while hovering over the bike you were causing it to shift left or right. “Fore and Aft” – While hovering on the pedals, shift weight very far to the front. The goal was to actually touch the stem. Then rock waaaaay back, behind the saddle if possible. Stopping Drills. Various ways to stop the bike, which is a good and important aspect to mountain biking. The most dramatic was the sudden stop, where we coasted down the slight incline and then had to grab both front and back brake and come to an abrupt stop. The coaches were there to catch you if you started to fall over. Ascending and descending – They put either your front or rear wheel on the bench of a picnic table and held your bike steady while you climbed aboard and then had to stand up and find your balance. Front Wheel Lift – “weighting” the front wheel by pressing down and then quickly popping back up. We had to try popping over some small cones. Actually when I say cones, I mean markers, as they were really only about an inch deep. A couple of gals managed to smash the markers. 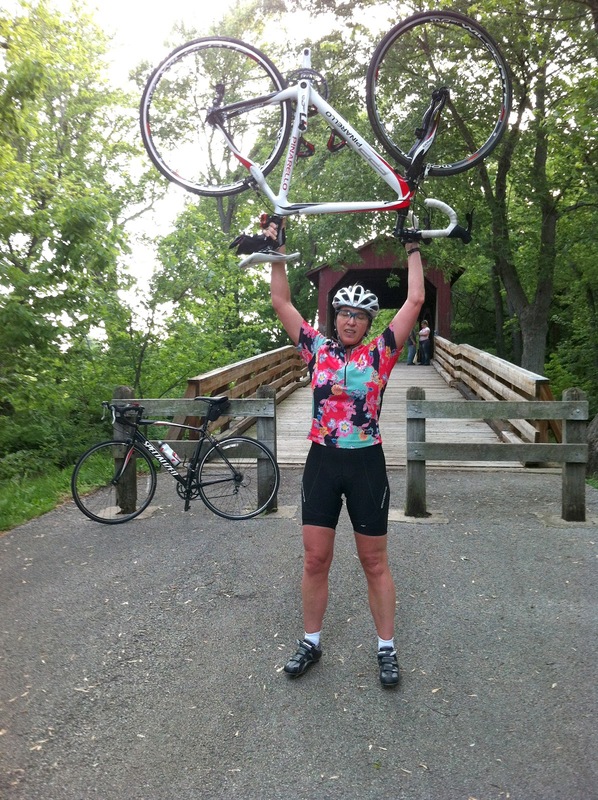 Rear Wheel Lift – I didn’t think this could be done since they took our clipless pedals away, but Suzanne demonstrated (while wearing flip flops) how to wrap your foot around the pedal and pop the real wheel off the ground. I enjoyed this drill. It was the one drill I could actually execute pretty well. The drills consumed the entire morning and then we broke for lunch. There were Subway sandwiches with chips, and oatmeal raisin cookies. After lunch, there was a raffle (I won a hat, woot!) followed by something called The Naked Lady party where you could pick out gently used gear that clinic participants had donated. I hadn’t donated anything since my used stuff is usually pretty disgusting by the time I’m ready to get rid of it. Laura picked up a sweet Trek jersey that looked brand new. A group picture was shot. You know how it is getting pics of large groups --- by the time this process was finished, lunch break was pushing two hours and we were ready to get back to riding. Todd and Suzanne had decided that we should get out on the trails before the other groups to “beat the rush”. With Todd leading, Suzanne in the middle and a couple of the EMT guys bringing up the rear, our group was funneled onto the Limekiln Trail, which is tagged as a Beginner Level. The trail is pretty narrow and plunges you immediately into the woods. My definition of a beginner mtb trail does not include steep ravines at the trail’s edge but I guess they do things differently in Indiana. Here is a video of the trail that someone else made in 2009. The actual trail riding was interesting. When we were just riding circles out in the grass and doing drills, everyone was pretty much all on the same level. Now our group would split and reform periodically, with some riders falling back and others moving forward. On the 2.5 mile trail, we stopped four times to let everyone catch up and to listen to the coaches impart wisdom on various aspects of navigating singletrack. Forward progress was quite slow. Close to the tail end of the LimeKiln Trail, we came around a little bend and were confronted with a log pile. It wasn’t a particularly difficult obstacle but everyone was tired and hot and dammit, we hadn’t covered log piles. One by one we bumped over the logs and then waited in a grassy field near a log cabin for the rest of the group. It was a very long time before everyone was safely over the logs. I think a couple just threw in the towel and walked their bike over, rather than try to ride it out. More drills. We practiced riding in and out bright orange cones. Next was “ratcheting” where you work the pedals like a ratchet wrench rather than make complete circles. This was tough but fun. I’m still trying to figure out exactly where I would use this skill, as it seemed to be something that an advanced rider might need. The last drill was designed to teach very tight turns. The coaches used four cones to create a square shape that was maybe 8’ x 8’ and we had to kind of coast around this box, ratcheting the pedals when we needed more forward movement. I was absolutely horrific at this exercise, nearly toppling over at the slow speed. My bike is a 29er and this probably didn’t help. Another gal on a Marlin had similar problems. It was like trying to maneuver an aircraft carrier down a creek. The afternoon was done. We were asked if we wanted to ride the trail back or take the paved road. A handful of riders were so wiped out that they opted for the road, the rest of us wanted to ride the trails. This time Coach Suzanne led the charge, followed by Brenda, myself and the Marlin girl. I don’t know if she held back at all but we were flying on that trail and there was no stopping to wait for people. You could get up enough speed that you didn’t have to pedal much. The inertia would carry you. Our group at the end of the day. hot, tired but loving mountain biking. Thanks to Kristen for snapping this pic! This last little shot down the trail was definitely the highlight of the day.We reconvened at the parking lot, drove back to the cabin, taking another wrong turn in the process, got showered and went back for a cookout. As much as I love the idea of zooming through the woods on my mountain bike, the reality is that I don’t have a clue what I am doing. When registration for the 2012 MWMTBC opened up, I decided it was time to get some help. Reindeer Mary had also signed up for the clinic but then wasn’t able to go. My BT buddy Laura signed up, so I knew there would be at least one person there to hang out with. Going to the clinic alone would have been a little like dining out alone (at least for me) --- it would accomplish the mission but would be kind of lonely and make me self conscious. At the last minute, my friend Brenda took Mary’s unused registration. This was perfect since we had done quite a bit of trail riding back in the fall. The clinic is in Brown County State Park in Nashville, Indiana, about a five hour drive from home. There are about 3 different ways to get there. The quickest way was probably via Indianapolis and was mostly interstate, but this would have involved rush hour traffic around Indy. We opted to go through Decatur via 36. Brenda’s TomTom GPS did not approve of this decision and kept trying to send us to Indianapolis. Then it had a change of heart and began to angrily insist that we turn around. ﻿We eventually reached Brown County State Park, but I wasn’t exactly sure how to get to the Abe Martin Lodge, where I had booked a “rustic cabin”. Not trusting TomTom, I plugged the address into the iphone and it took us on a merry adventure down a private road that wound through thick forest, growing ever narrower before culminating in a gravel path that plunged down a steep hill. OK, it was a ravine. Complete with a No Trespassing sign. Clearly we were in the wrong place. It didn’t seem logical to have a hotel in a place that could only be reached by mule or 4 wheeler. The lodge was down the NEXT road. A kindly forest ranger working the gate gave us directions and we found the lodge easily. It’s a pretty cool place. You can either stay in the lodge, which is basically a hotel, or rent a small cabin. There are also larger cabins that could contain a big group. First glimpse of the cabin would lead one to believe that it was quite spacious. Then we realized that the cabins are split into four sections and our room was off the back. I think the room measured something like 12’ x 12’. You had to climb up some steps to get there. The room smelled kind of musty, not really in a bad way. It had that summer camp feel. The bathroom was small but very clean, and we had a small microwave, a coffee maker and a dorm size fridge. We had to do some rearranging of furniture to get the two bikes and luggage in, but it worked out just fine. 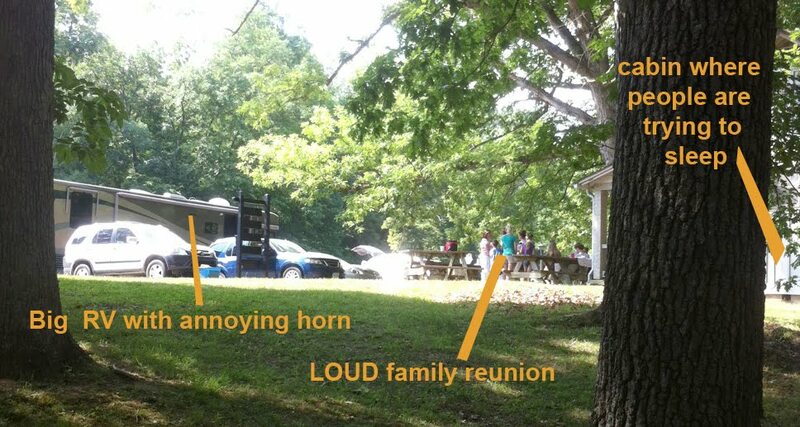 Laura had arrived a bit earlier and had the fortune to share a cabin with a very large, very loud group of people. It was a big family reunion. There seemed to be a lot of that type of thing going on. We decided to go to packet pickup. Laura climbed into the back of Brenda’s car and we drove over to the Rally Campground. We took a wrong turn but eventually found our way there. Laura tried to get out and discovered that she was locked in by the tricky child proof locks. Getting lost in the park and having Laura locked in the back would prove to be a theme for the weekend. After packet pickup there was a Meet N Greet at 7. We hung out there for about an hour and met some cool ladies, then learned our coach assignments. Brenda and I were in the Beginner Group with Suzanne as a coach. Laura was in the Intro group, which as it turned out was pretty much the same as the Beginner level. Tired after the long day of driving, we drove back to the lodge, getting lost again. Laura was still locked in the back and had to be set free. We hauled our coolers up to a patio at the main lodge and drank some wine and Summer Shandy. I had brought a bottle of Chardonnay and managed to destroy the lid with a corkscrew before realizing that it had a screw top. The cabin had a small air conditioning unit and we had set it on Stun before leaving, mostly to get the musty smell out. It worked quite well. You could have hung sides of beef in that cabin. The white noise from the a/c was soothing and I slept like a rock, except when I heard something scrambling up the exterior of the structure and running around on the roof. For some reason I blamed the children at the family reunion next door. Irrational, yes, but I was pretty tired and had been drinking a bit. Figured I was dreaming and slept like a log. On May 20th, I participated in the Gateway Olympic Triathlon at Lake Carlyle, Illinois. I won’t be so bold as to say I raced it, that term is reserved for people who actually race, but I will call it a successful event. In 2011, this race was my first Olympic distance triathlon. I really had no idea know what to expect. I had done a handful of sprint distances and my training had been adequate. The swim went fine although I got winded a few times and had to do take a few breaks to collect myself. Once out of the water, my heart rate skyrocketed and pretty much stayed stuck in overdrive for the duration of the event. This was aggravated by an asthma attack. In retrospect, this probably wasn’t entirely due to the pollen and exercise but more a factor of the hotel I stayed at. There was someone smoking in the room next to me (is that even legal in Illinois????) and I woke in the night feeling like I was being suffocated. So breathing was compromised from the beginning. Oh, and it was hotter than hell. I finished but the whole experience just kind of sucked and I was ready to hang it up. So the goal for 2012 was to keep the breathing under control, stay calm, and see if allergy/asthma meds could keep the airways open. I drove down on Saturday with Reindeer Mary’s husband, Troy. This was to be his first Olympic distance triathlon. We met up with Mike Ransick and tried out the swim course, which had been changed up a bit. The water felt pretty good in my wetsuit although I saw a couple of people opting to swim without. Of course this set off a spiral of doubt in my mind --- should I just leave the wetsuit in the car? Will I overheat? Do I really need it? Why didn't I bring a sleeveless? In the end I opted to wear the wetsuit. The swim was great, I didn’t really need to stop and rest this time and my sighting was good. Lake Carlyle is a very large lake, not very deep, and the water was murky but more of an emerald green than the silty brown you would normally see in Illinois. The course had been changed to more of a rectangle and you kept the buoys on your left. I did get clobbered pretty hard on the last stretch by a guy who was zig zagging. I just could not seem to get out of his way. At the beach, I sat down in the shallow water and peeled out of the wetsuit, as I had done at Racine. Something about getting some water in the suit makes it easier to remove. Naturally my suit promptly got caught on the timing chip and this small delay added probably another minute to my swim time. Maybe more. But it was all good, I treated spectators to a comical display of how not to remove a wetsuit and then sheepishly trotted up the hill to transition. Heart rate spiked a bit going into transition so I walked to my bike and just tried to keep things real. Took a hit of albuterol before setting out and made sure to take sips of water every mile. There are a couple of somewhat challenging hills on this course that seemed more manageable this year. Over the winter, I spent some quality time on the trainer doing Sufferfest workouts, and I think this interval training paid off in easier hill climbing for me. The run was tough. I knew it would be hot and decided from the start that I would Gallowalk the whole thing. And I did. This strategy paid off with a faster time than 2011. All in all I shaved just under 5 minutes off my 2011 time, but more importantly enjoyed the race. Post Race Meal – I grabbed a small sub sandwich and ate the meat and cheese, not really hungry enough for all of the bread. By the time our group was packed up, everyone was hungry. We stopped at Kahunas in Greenville for some serious cheeseburgers. Went out with Steve for a ride this evening. Stopped at the Covered Bridge in Glenarm and got this shot of me with LaPina. Would not have attempted this with my mountain bike. The 2012 triathlon season is now underway and my first race, the Sullivan Sprint, is behind me. This winter I spent a lot of time focusing on my swim and this was reflected in a two minute improvement over my 2010 effort. Funny how excited I got over two minutes. My next race is the Gateway Olympic at Lake Carlyle, Illinois. But enough about racing. Sometimes in our quest to follow some ordained training schedule, it's easy to stop living in the moment and find pleasure in the simple act of exercise. I find that I get so wrapped up in getting the workout in, that I forget what this is all about, which is the pursuit of a hobby that I enjoy. And so in the spirit of living in the moment, for the month of May I am going to find some small pleasant fact about each and every workout. And just maybe someday in the future, when training is no longer fun, I will come back here and reread these posts as a reminder. May 1 - This morning I went for a run. There were quarter mile repeats included in this, which are never easy, nor should they be. Then a couple of miles in Zone 2. I jogged into the heart of Chatham down Route 4 and passed between McDonalds and Hardees. Even though it was just barely 5 a.m., the smells of hash browns wafting from the two fast food eateries was pure pleasure. This evening I took my old Cannondale out for a spin. 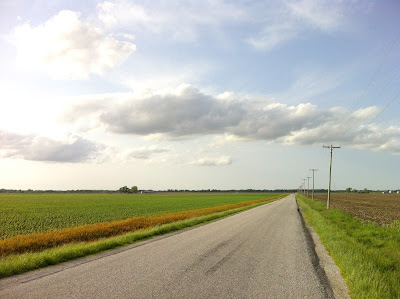 We have been having some serious thunderstorms and I had doubts about going very far from home, so I kept it close by following some small country roads that wound through the neighboring cornfields. Central Illinois may lack hills and thick forests, but there's a certain lonely beauty to the vast farm fields. I had to stop and snap a pic.